When you create term sets in one site collection, by default, they’re not available to other site collections in the tenant. 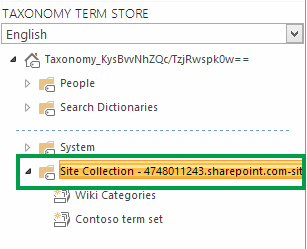 However, you can give site collections access to term sets that you’ve created in other site collections. For example, if you’ve created a catalog tagging term set in an authoring site collection of a cross-site publishing scenario, you can give the publishing site collection access to the tagging term set. Make sure that you’re a member of the Owners SharePoint group on the site that contains the term set. From Settings , select Site Settings. On the Site Settings page, in the Site Administration section, select Term store management. In the Term Store Management Tool, select the group that contains all term sets within the site collection. In the Site Collection Access section, type the URLs of the site collections that you want to give access to the term sets.